Sewing can seem like an expensive or gadget-heavy hobby, especially when a visit to the haberdashery section in a department store or craft shop reveals racks and racks of tools, threads, fastenings and other bits and bobs. If you want to take up sewing to care for your clothes and live a more sustainable lifestyle, buying a lot of new items (often encased in plastic packaging) might seem counter-intuiative and off-putting. 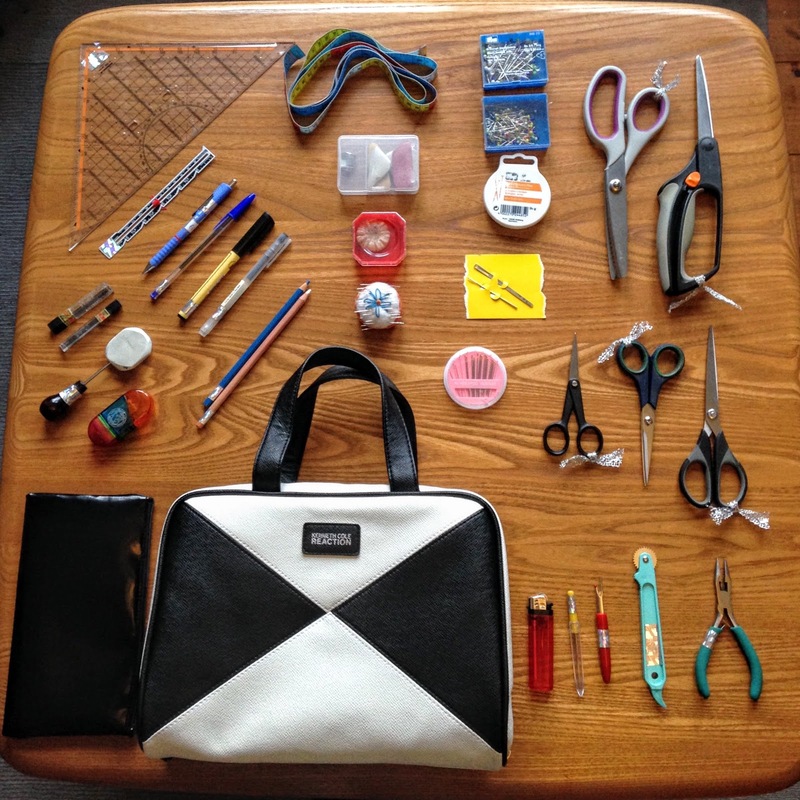 We’ve all heard the saying “A bad workman blames their tools” but when you are sewing a variety of fabrics, quality tools make all the difference. Novelty sewing kits look really cute but they won’t always contain the best tools for the job, and the cheap haberdashery basics available from supermarkets or corner shops will be fine for sewing on a button but won’t last if you’re planning to sew on a regular basis. Poor quality pins and needles can snag your clothes, and blunt scissors make cutting fabric more difficult than it needs to be. I am left-handed but learned to cut with right-handed scissors, so they are useable, but the shaped handle (like this pair of orange Fiskars scissors) gets uncomfortable if I am cutting out for a long time. The Fiskars soft-touch multi purpose scissors have a soft grip and a spring mechanism, so they are great for ambidextrous stitchers and anyone with joint problems. Specialist left-handed scissors are also available from craft suppliers, but you’ll have less choice and they may be pricier. I've seen Fiskars scissors available for between £13 and £18, so it's a good idea to shop around. I use a small, sharp pair of scissors for snipping threads, and for unpicking; I find the tiny pointed blades are more accurate than the hook of a seam ripper. My 4 inch Kai embroidery scissors are my favourite all-purpose pair, but if you’re attached to your seam ripper, the classic "Stork" embroidery scissors are a good buy. Kai scissors are around £13-£14, Stork scissors are between £6 and £8. This is something you don’t need to spend a lot of money on, but as a left-hander I prefer one with measurements on both sides, otherwise I often find myself measuring in the “wrong” direction, or upside down! Extendable tape measures are fine for taking body measurements that don’t need to be perfectly accurate, but I find the flat metal end of a wider tape measure more useful when I’m measuring and marking an alteration.A decent tape measure will probably cost £2-£3. Hand-sewing needles are a real personal preference; I prefer using a long, thin needle unless I’m sewing something very thick, but that won’t suit everyone. John James make professional quality needles, but sell them in sensible amounts for home sewing too. If you’re just getting to grips with hand sewing, I would recommend getting an assorted pack, then buying a specific size if you end up having a favourite. "Pebble" packs, where the needles come in a handy little container, are £1.45, needles in ordinary packaging are around £1. Not everyone finds they need a thimble for hand sewing, but if you do want to use one it’s important to find the right size! People with medium to large hands will probably find something adequate in most haberdashery suppliers; if you have small hands or narrow fingers your best bet is probably Thread and Trimmings who supply seven different sizes of thimble (compared to the usual three - S,M and L).I’ve also found really comfortable thimbles in antique or bric-a-brac shops. A decent thimble shouldn't cost more than about £2. Other useful tools I’d recommend adding to a sewing kit if you are doing a lot of mending and alterations would be pinking shears, a measuring gauge, a technical drawing set square and a darning mushroom! There are other pieces of kit that come in really useful if you are interested in making clothes from scratch, and I’m planning to cover sewing thread in a separate post, because using the correct thread can make a real difference to the success of a sewing project. Leave a comment or come to find me on social media to chat all things sewing-related, or if you think I’ve left something vital off this list. How many times have you picked up a garment from a high-street shop (which wasn’t super stretchy) that fitted you perfectly? It’s a great feeling when it does, but most of the time that’s not what happens. We’re left contorting ourselves in the changing room mirror trying to find the garment’s best angle, wondering what we can wear it with to hide the bit we don’t like or planning to cinch it in with a statement belt. It’s not surprising that high street clothes aren’t a perfect fit, when patterns are initially developed for a fit model (who probably has a very different body shape to the majority of people), and then graded up and down to (imperfectly) fit a range of sizes. Our dissatisfaction with these imperfect clothes increases our rate of consumption as we discard all those outfits that never really worked in a fruitless search for that elusive perfect fit. Understanding why our clothes might not be ideally suited to our bodies is an important step towards having a more positive self image, and reducing our consumption of clothing that makes us feel unhappy. Here are five things I’ve come to understand about the fashion industry that have helped me change my habits. For gender neutral garments like jeans, there are more straightforward sizing options to give shoppers a fighting chance of finding something that fits. Measurements for the waist and inside leg length, as well as a description of the expected fit (skinny, tapered leg etc) help to narrow down your options (although I’d argue that a hip measurement would be helpful too). For women’s clothing sizes - size 10, 12, 14 etc- there are no standard measurements, brands can decide for themselves what measurements they want to allocate to each size. This might be determined by a profile of their average customer, their age and lifestyle, with the concept of “vanity sizing” - giving a garment with larger measurements a smaller-sounding size to encourage customers to buy it - complicating matters further. Big brands are likely to use different fit models for different ranges, and send patterns and samples to different factories, increasing the likelihood of discrepancy in sizing. When I was checking labels to find out what my clothes were made from, and where they were made, for my Wardrobe Diary, I noticed that I had clothes in a range of sizes from certain brands, even though my body shape hasn’t noticeably changed for years. Of course, clothing is designed with a specific fit in mind, and there is nothing to stop customers buying a larger size for a looser fit, but it can add to a sense of confusion about sizing, especially if the clothes aren’t shown on a model to give an idea of the intended proportions. This excellent interactive size chart, What Size Am I? is a real eye-opener if you always feel disappointed that high street clothes don’t fit quite right. Enter your bust, waist and hip measurements, and you can see how your body shape corresponds to the measurements used by different high street brands for each of their sizes. Of course, the body is three-dimensional, so even if your measurement corresponds to the measurement given by a brand on their sizing chart, that doesn’t necessarily guarantee a good fit. If your proportions are different to those of the fit model, that can cause fit issues. My 35 inch bust measurement could easily apply to someone with a larger rib cage and smaller breasts. It could encompassa range of bra sizes from an A to an E cup, which can make a huge difference to the fit of clothes. When standard size patterns are “graded” (converted into a range of different sizes by increasing or decreasing the proportions of the original pattern, usually designed for a size 12), this is usually done in uniform increments, which is not the way the human body develops! Anyone with a longer or shorter than average torso, a fuller bust or wider hips, can find their body shape at odds with conventional sizing. If you study a beautifully proportioned 1950s suit, a chic 1940s tea dress or a drapey 1930s gown, you’ll see that the construction of these garments is pretty complicated. Intricately shaped pattern pieces, carefully positioned darts and hidden padding or boning all contribute to a perfect fit. These features correspond to a unique body shape, and garments with many different pattern pieces and lots of detailing are time-consuming, and therefore expensive, to make. Simple, boxy shapes that need minimal machining make a more efficient use of fabric, and a loose-fitting garment is less likely to be rejected in a fitting room if it isn’t an exact fit. Whether we’re looking at a celebrity at a red carpet event or the host of a TV show, if they are looking flawlessly dressed it’s probably because they have had behind-the-scenes help from more than just a stylist. As well as having clothing selected for them to ensure that they look perfect, whatever the occasion, anyone with a role in front of the camera is probably having their outfits altered by skilled seamstresses like my friend and former colleague who runs Grace Lane Studio. Brands want their clothes to be seen in the best light for any sort of advertising campaign, and altering the garment itself is less noticeable in a world which is becoming ever more savvy to airbrushing or digital manipulation. It was never intended to. From the simple shape of a 1960s A-Line mini dress to the snug embrace of a body-con “bandage” dress, the styles that have transferred most efficiently from high fashion to fast fashion rely on a cut that skims over the exact shape of the body, or a fabric that stretches and moulds to the body. Our most comfortable mass-produced purchases are probably either loose or stretchy (or both) because it’s impossible for fast fashion to perfectly fit every one of its millions of customers. I’m not suggesting that we should all ditch factory-made clothing entirely and only wear couture or clothes we’ve made ourselves; factories have the advantages of economies of scale, bringing prices down to an affordable level, and specialist hardware, software and expertise that have been used to create clothing we’d struggle to duplicate at home. We do need to remember, though, that we can’t expect perfection from fast fashion, and it would be great to start normalising altering clothes to get the exact fit or style we want. I’m going to put some tips and ideas up on the blog in the near future, so keep checking back, but if you know you’re unlikely to do the alterations yourself it’s worth doing some quick calculations to see how paying for alterations could actually save you money when you’re shopping on the high street. If you buy a pair of trousers for £30, but only wear them three times because you’re unhappy with the fit, they have cost you £10 per wear. 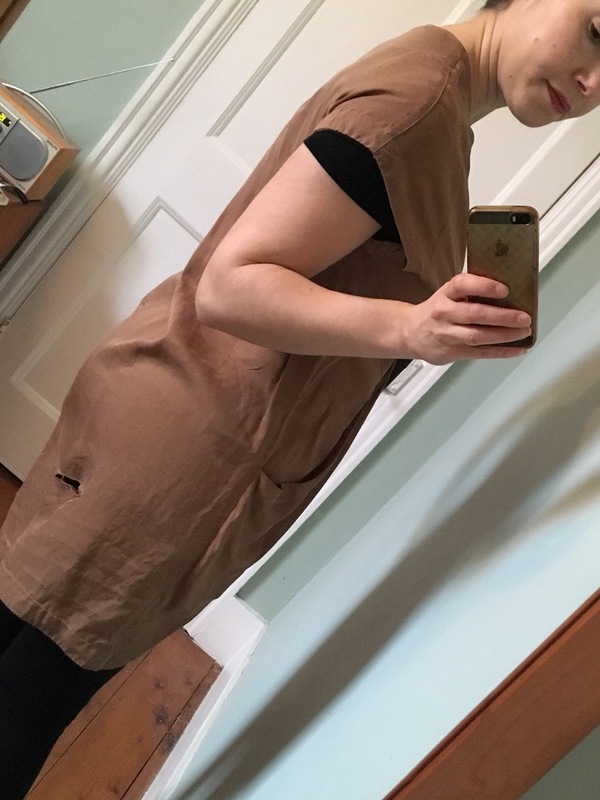 If you spend an extra £30 on getting them professionally altered to fit perfectly, and you wear them thirty times (the ethical fashion community’s baseline for a garment to be worth buying), they have only cost you £2 per wear! Saving money in the long run and saving the planet seems like a win-win to me. 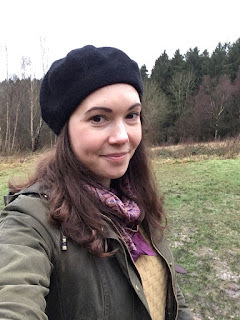 Since 1st January 2018 I’ve been keeping a Wardrobe Diary, to get a better idea of whether I’m actually wearing all my clothes or whether I could downsize a bit, and to help me plan future purchases. This month, I’ve been working out what sort of information I want to collect and focus on, as well as looking at where my clothes were made and what my ratio of new to secondhand purchases is. 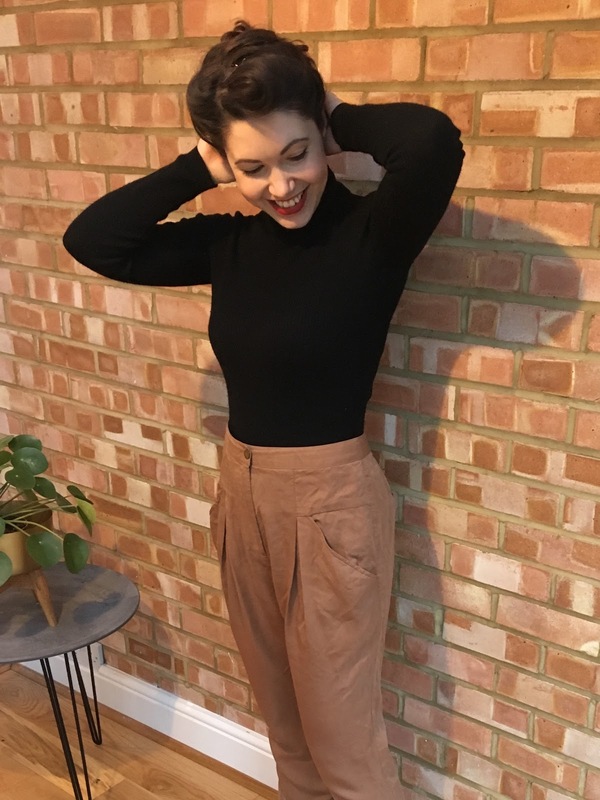 I also used the ratings given to clothing brands by Ethical Consumer magazine to assess a week’s worth of outfits and to learn more about the rationale behind these ratings, and what high street brands can do to improve. 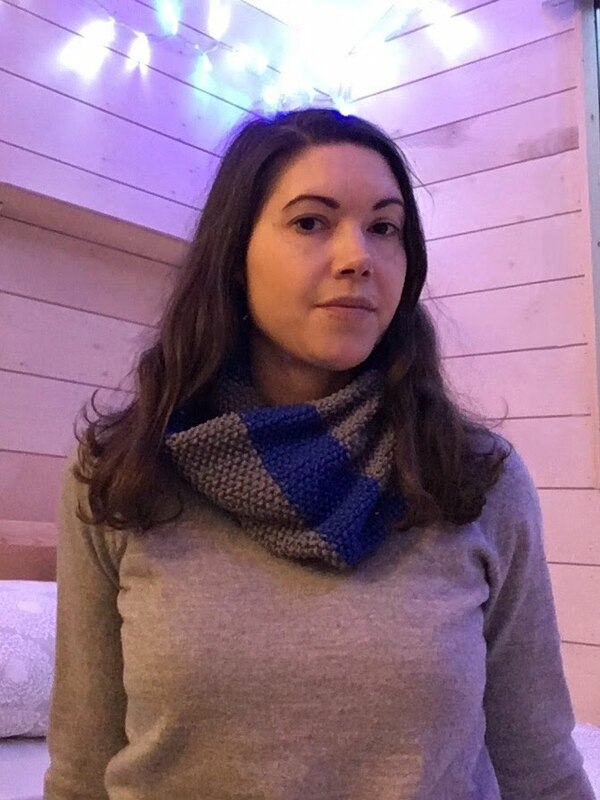 At the start of Week 1, I was away on a short holiday, so I’d packed mix-and-match knits and cosy layers so I wouldn’t have to think too much about what I was wearing. 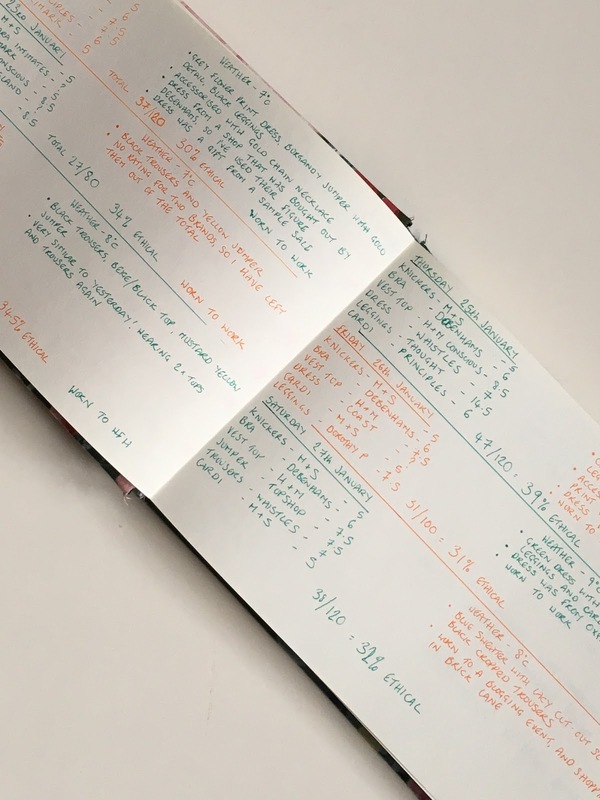 I started off recording quite a lot of information, but soon realised that this would be far too time-consuming to do on a daily basis, and I’d need to focus on a particular piece of information each week. Thinking carefully about what I was wearing every day made me realise I was probably washing outer layers like jumpers far too often, so when I returned from my holiday I planned outfits around clothes I’d already worn that week which weren’t quite ready for a wash. I also made an effort to wear clothes I hadn’t worn for a while, and discovered that a dress I’d ignored for a year was a great addition to my work wardrobe! For Week 2, I looked at the labels in my clothes to see where they were manufactured, and was quite surprised by the results. I had expected several items from China, India and Bangladesh, but hadn’t expected to find items from Tunisia, Morocco and Romania. The only pieces of clothing made in the UK were either vintage, or made by very new start-ups (or in one case, made by me!). I don’t have a problem with fashion being a global industry, and I wouldn’t presume to tell people where they should or shouldn’t work, but I do think that as western consumers we should take a bit more notice when low prices for us come at a huge cost to others. As someone who is paid a good wage and has the freedom to join a union, it is my responsibility to stand with garment workers when they speak out about punishingly long hours or health and safety concerns. Next month, when I look at who made my clothes, I’ll be thinking of ways I can support them. I kept a record of whether my clothes were new or secondhand for Week 3, trying not to have this in mind when I was planning outfits. I wanted this to be an assessment of an average week, not an attempt to wear as many secondhand clothes as possible (although I might try this as a challenge one week!). The percentage of secondhand clothes I wore was fairly low- only 9 out of 51 items, or 18%. I wonder if this percentage will grow as the weather gets warmer, and I’m not wearing so many base layers (which I don’t buy secondhand)? As I had been gifted an Ethical Consumer Magazine subscription, which allows me to access their product guides and ratings tables, I used their table of High Street brands to give my outfits an ethical rating for a week. Their ratings system (each brand is given a mark out of 20) takes into account a company’s treatment of workers, animals and the environment, as well as any political affiliations. If you’re interested in finding out more about their ratings system, and the complex international supply chains that they track in order to give an accurate score, I’d highly recommend getting hold of a copy of their September/October 2017 magazine (issue 168). I tried to wear mostly brands that were featured on this list for the week, which alerted me to notable exceptions. Brands owned by the former Aurora group - Warehouse, Oasis and Coast, among others - were not featured, nor were River Island or Jaeger. I was dismayed (but perhaps not surprised) by how low a lot of reputable brands scored. It was encouraging to see that ethical initiatives like H&M’s conscious collection merit a higher rating, but it still doesn’t bring them in line with brands that market themselves specifically as ethical. Jersey basics from Thought gain a score of 14.5 out of 20, while a vest top from H&M’s conscious collection would only score 8.5. My average outfit was only 33% ethical, or scored 6.5 or 7 out of 20. My highest score was given a boost when I wore my Thought leggings; wearing underwear and knitwear from Marks and Spencer contributed to my lowest score. There are now several resources that help consumers analyse how ethical their wardrobes are: the Not My Style app gives a red, amber or green rating to high street brands, and Fashion Revolution's transparency index rates brands on how much information they reveal about their supply chain. I’m planning to review another week’s worth of outfits according to these different criteria to see what else I can learn. Other weekly assessments will focus on plastics vs natural fibres, an in-depth look at laundry, and how easy it would be to recycle my wardrobe using current technology, as well as some fun outfit challenges. I’m planning to repeat a 13 week series of weekly observations four times, to see how the changing seasons affect my clothing choices. If you want to suggest an outfit challenge, leave me a comment or say hi over on Twitter!